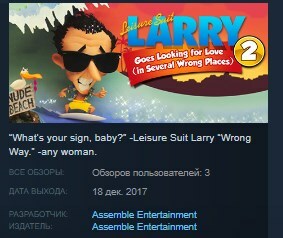 Leisure Suit Larry Goes Looking for Love (In Several Wrong Places) is the second game in Al Lowe´s Leisure Suit Larry series. Continuing the plot of the previous game, the swinging single Larry Laffer has finally found his true love and is happily living with her. Right? Wrong!.. Because Larry is mercilessly thrown out by his great love and is left all alone, penniless, and womanless, in Los Angeles. Accidentally, Larry comes into contact with KGB agents who will pursue him all over the globe from now on. And there is also the evil doctor Noontonyt plotting evil schemes on a remote tropical island... Looks like Larry will have to forget about his women-related problems for now... or is it so?